Kindle Fire HD, the most ambitious Amazon tablet made its appearance in many of the countries a month ago and has since become one of the most attractive offers for users who want to acquire a quality tablet without spending too much money. And is that for 199 euros, we will get a good 7-inch tablet with a high resolution screen (1280 x 800) and speakers that surpass in quality to most tablets on the market. But when you consider that Google sells its Nexus 7 for 249 euros, no doubt many will wonder whether it is worth betting on the Amazon product among other things, lest we forget, even offers all contents of Google Play, but a limited selection of content. And here we brought you another review of Kindle Fire HD which will tell that is it worth to buy this tab or to go with another tablet. Kindle Fire HD if we consider only the hardware, then it is one of the best seven-inch tablets of the market. Especially surprising is exceptional screen. With a resolution of 1280 x 800, outperforms rivals as iPad mini (1024 x 768) and even to the Google Nexus 7. Besides Amazon asserts itself, including a polarizing filter and anti-reflective technology to improve outdoor vision and increases the viewing angle. Our experience is that the change in external view quite similar to any other high quality screen (i.e. only for very specific uses) but if it is true that the vision improved interior, including backlight. As the angle of view fall short of the best with nothing that we objected at this point. Amazon boasts that their Kindle Fire plus HD is the only one offering dual wireless dual band antenna for downloads, speeding up playback streaming content. We have not noticed a big difference to the speeds you can get with a tablet like the iPad, and while it is true that streaming content is good, we also found that offers a notable difference to what we found in other products. Yes it is true that this may be different in the United States, a country in which Amazon offers its own video content. Where we do have to give them the reason is when we claim to offer “exclusive Dolby Audio system with two-way speakers for virtual surround sound,” which actually translates into two small-large speakers on either side of screen. We hear even in products like the Apple iPad, the quality and power of sound that offers Kindle Fire HD is just remarkable. From our experience this is probably the only tablet on the market that are worth listening to a movie without having to connect a headset. Otherwise, Kindle Fire HD a dual core processor of 1.2 GHz and a PowerVR graphics card Imagination 3D, without much fanfare move easily throughout the operating system, except of course those games and applications for their resource demands have not been included in the Amazon Appstore, but are present in Google Play. It is a point that although many would be uncomfortable. 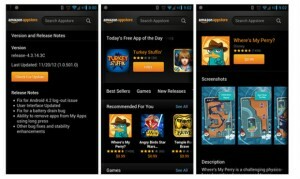 Amazon ensures that apps offered in their store, they work. 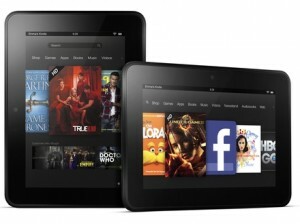 The Kindle Fire HD set comes complete with an HD front camera, a micro USB port, HDMI port and headphone connection for Jack. In terms of design, we found a minimal bet not always quite work. Although it is certainly a stylish tablet, does nothing to offer completely flat buttons, which costs peering locate even the side of the screen as the touch pass almost unnoticed. On the other hand also has seemed somewhat heavy compared to other seven-inch tablets and of course the feel is not as nice as the iPad mini or as mild as offering Nexus 7. Finally also interesting the life of your battery, Amazon Kindle Fire HD stands at 11 hours. Kindle Fire HD is designed by and for Amazon. And if it is true that the tablets are devices designed primarily for consuming content (especially the seven-inch) for Amazon product takes this premise to its logical conclusion. The software layer built on Android is certainly a statement of intent. And do not misunderstand us: we agree. It is an interface and consumes content and does it intelligently. Disappears “old” idea of having a screen full of icons and kicks in a nice carousel that shows the last book you are reading, the film we’ve left off that album or that we like to hear. Another Amazon service which is present in Kindle Fire HD is its cloud Amazon Cloud Drive, which integrates nicely into the whole operating system. Not only is it great to just turn our Kindle available to us all that we have purchased, but in the same way, all we have stored in Cloud Drive is available to the user in a fully transparent, without having to navigate between files and folders. Your only limitation is that by default, only plays video MP4 Kindle, so if we got another format to Cloud Drive, our device will not read. The same applies if you store videos on your hard drive, but in this case we can have apps like VLC to play the content. The good news is that Amazon instead like Google, offers 5 GB of free space on your cloud, but unlike the Internet giant, offers really attractive price plans. In this sense, 20 GB for 8 € / year, 50 GB for 20 € / year, 100 GB for 40 € / year, 200 GB for 80 € / year, 500 GB for 200 € / year for 400 GB and 1000 € / year. Speaking of cloud, we cannot forget Silk, which integrates the default browser. Although progress has been made with respect to the version that appeared a year ago in the Kindle Fire original Silk remains a browser that is far from what you can offer a good browser. The page load is not too fast and failure rendering them more desirable. This of course would not be a problem if we could install one of many browsers present on Google Play in Kindle Fire HD. When we think of a closed ecosystem, we all come to mind a name: Apple. Yet few speak openly of the Amazon ecosystem created around their products much more closed than Apple does with their own. The best test to understand this is to see how is your Amazon Appstore. Though the company of Jeff Bezos says that the existence of your store is an effort to have quality applications, in reality this is only an excuse to end their competition, when not exercising censorship plain and simple. We understand for example that Silk is the default browser that is offered on Kindle Fire HD, as we understand it Safari iOS or the Android Chrome. What we cannot understand is that Amazon refuses the possibility of using another. Unlike other stores on Amazon apps we will not find Chrome or Opera and many others. They simply do not exist. The same thing will happen with email management and generally any product that conflicts with the strategic lines of Amazon. We will not be able to install any Google product (even something as harmless as Google Maps or Google+), we will not be able to install alternative eBook Readers of a certain quality, we will not be able to install applications to read magazines (Zinio, Kioskoymas) we will not be able to install the most popular comics readers from Google Play on Kindle Fire HD. The same applies to “the cloud”. As bet all your Amazon Cloud Drive, all other options have been expelled: no Dropbox, Google Drivem nothing, nothing Skydrive, etc. But there is more. As Amazon offers its own app store, if for example we bought a smartphone app for our Android and want to install it in our new tablet (if it is available), we will pay for it again. I.e. Android paid applications doubled the pay for, which of course does not happen if you have an Android smartphone and tablet market any other Android based. Certainly there are ways to open this garden and if we have expertise and some tutorials on the Internet, we can install Google Play in Kindle Fire HD, but it is a process that certainly is not for everyone and especially, is illegal. 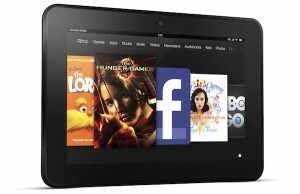 Undoubtedly Kindle Fire HD tablet is a good, even a great tablet. But it only makes sense for Amazon lovers. If we are willing to completely trust the wisdom of Amazon, this is definitely our tablet. If all you want is to consume content, read books, watch movies, listen to music and surf the Internet in a timely manner, is a very good option, because in addition to the work of integration and synchronization of content is outstanding. But if you want something more, if we want to have the limitations imposed on us by Amazon, which advise us 50 euros more with another great product as Nexus 7. So, now you know all most things regarding Kindle Fire HD, now you can decide Nexus 7 for you or Kindle Fire HD for you, stay tuned with us for more updates. «How to activate LTE in Nexus 4?